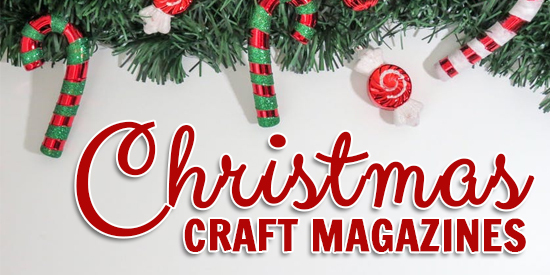 Let’s get Christmas Crafting with our range of Craft magazines! This year give Christmas a personal touch and create your own homemade gifts, holiday decorations, and Christmas stockings. Whether it’s a gift for him or her, a present for a friend or a co-worker, make a handmade gift for everyone on your Christmas list. Get the kids involved, too. 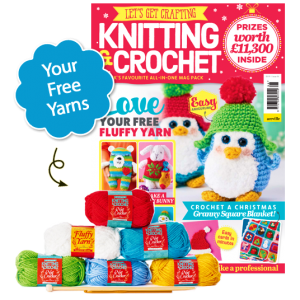 This latest issue is a festive knitting and crochet special. It comes complete with 65 Christmas patterns, 6 balls of yarn, knitting needles and a 5mm crochet hook to get readers started. With easy to make gifts, in under an hour, create a super soft fluffy bunny or knit a snowman family. Plus, get ideas on making simple Christmas cards in minutes. Or subscribe to Let’s Get Crafting magazine today and never miss an issue. This latest issue is a seasonal special with ideas for cosy winter living. It comes complete with 2 free gifts including a festive reindeer tree decoration stitch kit and a Nordic project book. Plus, amazing make it ideas including easy-sew cracker cushion, 3 Christmas jumper designs, festive table settings, crochet baubles, tassel earrings and more. 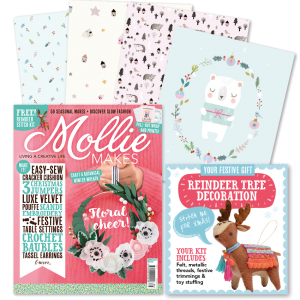 Or subscribe to Mollie Makes magazine today and never miss an issue. 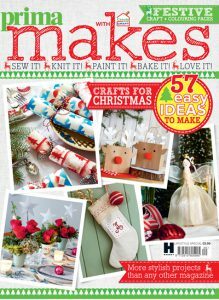 This latest issue is full of Christmas Craft ideas, including easy makes, simple sewing, paper makes, creative crochet, perfect knits, decorative stitching and baking. It comes complete with 8 gift tags with twine, 5 metres of red and white twine, 5 metres red raffia, 1.5 metres of green ribbon and 1.5 metres of white ribbon perfect for Christmas gift wrapping. Find 57 easy Christmas craft ideas to make including, fabulous foliage garland, see-through pompom baubles, smart tartan Santa sack, Reindeer decorations, and six delicious seasonal bakes. Or subscribe to Prima Makes magazine today and never miss an issue.